Catholic University students met out on the Pryzbyla Center Lawn to pray for the victims of the Parkland school shooting on Wednesday, March 14th, one month after the tragic event that left 17 dead at Marjory Stoneman Douglas High School in Florida. The event, hosted by the CUA College Democrats organization, was the school’s way of participating in a nationwide school walkout demonstration organized by Women’s March youth group “Empower”. Just under 3,000 student-organized walkouts took place across the nation according to the group, which recommended that the demonstrations last 17 minutes to honor the number of people killed in the massacre. Students were encouraged by organizers to leave class for the time period to participate. Across the country, some school administrations threatened disciplinary action for the walkouts, while others supported the demonstrations and let them proceed. How to go about the walkout was up to each of the school organizers. The demonstrations varied in size and manner, ranging from small gatherings for prayers to honor the victims to larger, more public rallies protesting gun violence. Across the United States, national news outlets featured many of the events at high schools and colleges. The demonstration at Catholic was a gathering to pray for the victims in the shooting. Titled “Parkland Prayer – Walkout at CUA,” the event began and ended with a prayer led by Rev. Jude DeAngelo, OFM Conv. In between the prayers, CUA Democrats president Rachel Simoneau thanked everyone for coming together to honor those who were killed, and asked to keep them in their thoughts throughout the day. Simoneau read each victim’s full name before Rev. DeAngelo followed with a blessing. About thirty students gathered for the demonstration in front of the Pryzbyla Center entrance. “Thank you students for coming out and making a statement today. Hopefully these statements will lead to real change,” DeAngelo said. 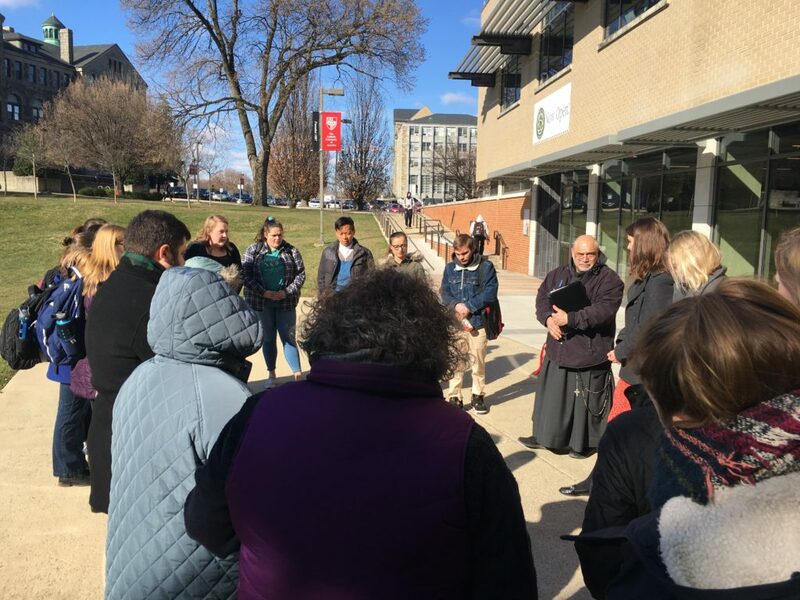 Simoneau and the CUA Democrats organized the prayer as a public act after meeting to discuss what would be an appropriate option to show support. In an email sent by Simoneau on Tuesday, March 13th, the student organization noted that it had received assurances from Associate Dean of Students Stephanie Davey that students would not get in trouble for leaving class for a walkout nor would College Democrats be penalized for planning this event. Students who participated were glad the event was organized to show support and be involved in the national conversation. Others didn’t see the point for such a demonstration, also citing disapproval for Campus Ministry’s involvement after the university tweeted out a picture highlighting the partnership. The students who participated in Catholic’s own ‘walkout’ hope that their prayerful participation in the national event can inspire more civil conversation on the matter of gun violence.